The destruction of a major bridge in a flash flood in the Summer meant re-routing the famous Pink Heifer (not post marked) trail. Lucky for us this has made it even better!........ Click below for more info. 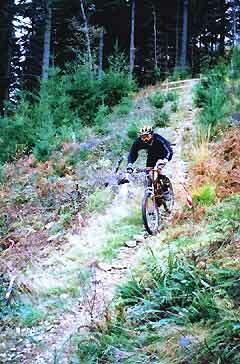 MTB Britain route guides The Pink Heifer at Coed y Brenin, top route in the UK for downhills, Guaranteed. Pink Heifer now re-routed! avoiding lost bridges. New Nant yr Arian Bike Trail.